Christmas: TM = A holiday board game. Ages 4+. Played by 2 to 6 people. 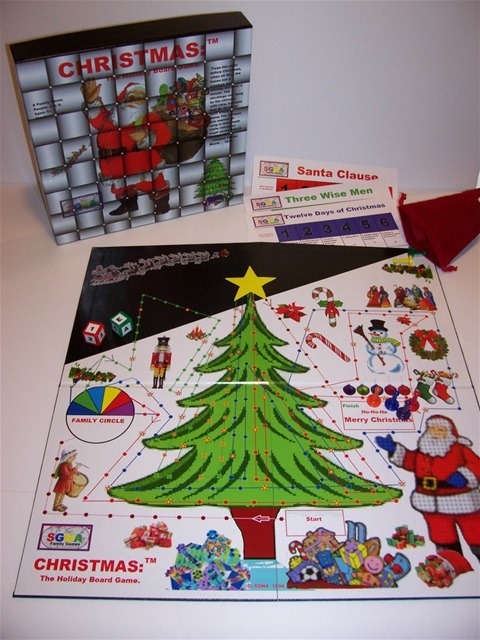 CHRISTMASTM is played with two-six sided dice, one die is numbered "1 to 6". The other die is lettered "A to F". Enclosed is an extra sticker for each dice symbol, encase of loss or application error. Each player receives a token to represent him or her on the playing board. This game contains "6" tokens. CHRISTMAS is played with 6 cards. The 6 colors of the cards are "Red, Dark Blue, Green, Yellow, Purple, Light Blue." Each card is also labeled at the top with one of the same names or phrases that are given to each track. One card is labeled, "Santa Clause" another card is labeled "The Three Wise Men" another "12 Days of Christmas" another "Santa’s Reindeer" another "Frosty the Snowman" and the sixth card is labeled "The Nutcracker". Place the playing board on the table, the players sit around it. Each player chooses a token to represent him/her on the playing board. Place tokens on the start area. Each dot, or star count as one space. 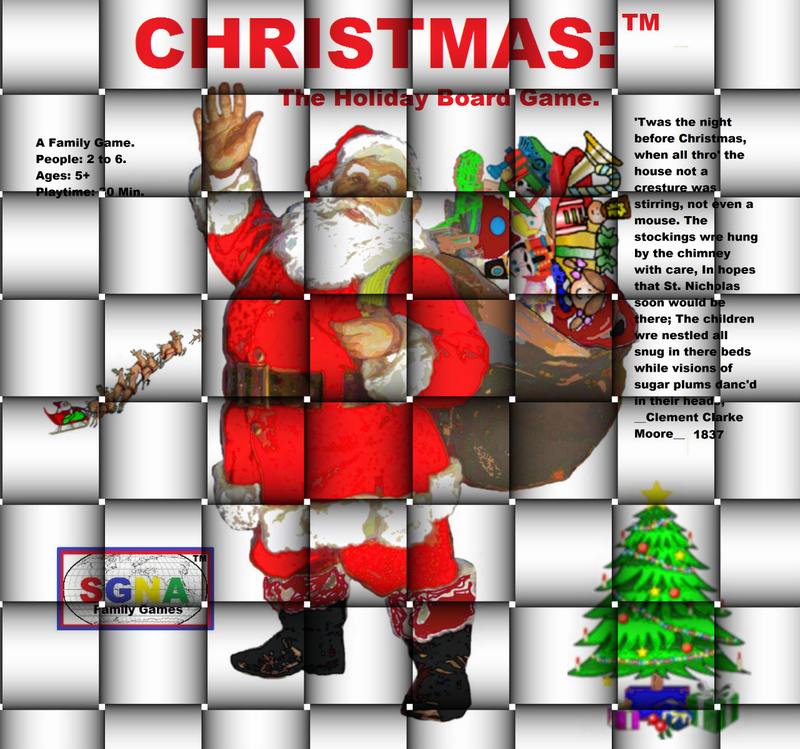 Two or more players may occupy the same space on the board by placing the tokens as close to the one dot as possible. The first player roles the numbered die (the lettered die is not used for this procedure) and then moves his token the number of spaces rolled up on the die. The player will be moving along the single track toward the FAMILY CIRCLE where the game breaks up into 6 different tracks. The second player takes his turn and so on. All players must land on the FAMILY CIRCLE. When the players land on the Family Circle, they pick a color coded card and topic to represent them for the rest of the game. The players then exit the Family Circle via the track, on their next turn, towards the large star atop the Christmas tree. The other players, in turn, do the same thing. As the players then follow one of the different tracks that they have chosen and a player lands directly on any small star , that player must then role BOTH the numbered die and the lettered die. When a player roles both dice, an address roles up. Example "A-3" or "E-5". The player then looks this address up on his/her colored and labeled card. The rectangle that corresponds to the address the player rolled up on the dice has instructions on it. Example: [+3, --2, etc. ]The tracks eventually intersect at the large STAR on top of the tree. The players must land on this star and in order to exit the star the players need to roll a 1 or a 6 on the dice. The players follow this single exit track to the finish area (Merry Christmas). The first player to land in the finish area (Merry Christmas), by following the rules, wins the game. ( C ) SGNA 1994.